A submarine is launched from the Ocean Zephyr off the coast of Victoria, the capital of the Seychelles on Tuesday March 5, 2019. Scientists are about to set off on a mission to explore the depths of the Indian Ocean, one of the planet’s last great unexplored frontiers. The mission will explore the Indian Ocean, during which scientists hope to document changes taking place beneath the waves that could affect billions of people in the surrounding region over the coming decades. 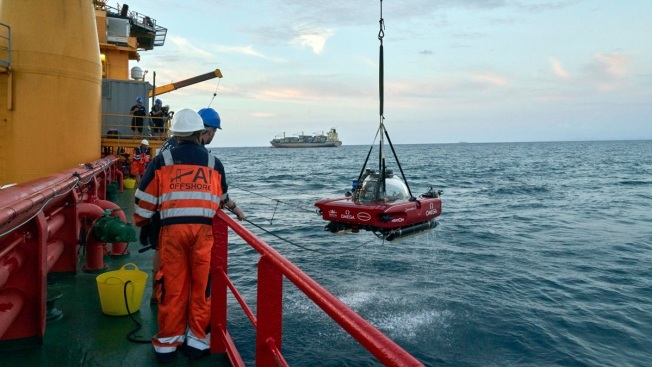 Scientists have set off early Wednesday on a mission to explore the depths of the Indian Ocean, one of the planet's last great unexplored frontiers. Here's a look at what the Nekton Mission hopes to achieve and why the people of the Seychelles, the first stop on this three-year expedition, are excited about its launch. The expedition is led by the Britain-based Nekton, an independent, non-profit research institute that works with the University of Oxford to increase scientific understanding of the oceans. It has chartered the Ocean Zephyr, a Danish-flagged supply ship, to explore the waters around the Seychelles, a collection of islands about 1,500 kilometers (930 miles) east of the African coast, over a seven-week period. This is the first of a half-dozen regions the Nekton Mission plans to explore before the end of 2022, when scientists will present their research at a summit on the state of the Indian Ocean. Along with 18 crew members there are 33 scientists, technicians and reporters on board. Researchers have started by heading to the Farquhar Atoll, a group of islands about 770 kilometers (480 miles) southwest of the Seychelles capital, Victoria. Further stops include Aldabra, a coral atoll that's home to a large population of giant tortoises and other vulnerable species. Scientists will survey underwater life by diving into the "twilight zone" below depths of 30 meters (98 feet) that the tropical sun barely reaches. Using two crewed submarines and a remotely operated submersible they'll be able to document organisms and habitats up to 500 meters (1,640 feet) deep, while sensors will offer a glimpse of depths of up to 2,000 meters (6,560 feet). WHAT DO THEY HOPE TO FIND? Little is known about this watery world. Yet what happens beneath the waves could affect the lives of billions of people who live along the Indian Ocean's shores in Africa and Asia. Already, rising water temperatures are bleaching coral reefs, with potentially serious consequences for other organisms. By conducting at least 50 "first descents" to map the depths around the Seychelles, scientists hope to better understand the marine ecosystem and the way this vast body of water is changing due to global warming. "If you save the islands, you save everybody," Ronny Jumeau, Seychelles' ambassador to the United Nations, told the AP in explaining the importance of countering climate change. "If the islands go, every port city, major port city, will go. Every beach in the world will go, every river estuary will go. Every delta, the Nile Delta, the Mekong Delta, you name it." The Nekton Mission has become the talk of the Seychelles, a nation of fewer than 100,000 people, since the Ocean Zephyr's arrival last week. President Danny Faure visited the ship last week, calling the expedition "a historical moment" for the nation. "The scientific community, the academia, the children around the world in schools, they see what's happening" to the climate, he said. "Why can't other governments see this? Are they blind?" The Seychelles government is developing what it calls a "Blue Economy" centered on the sustainable exploitation of ocean resources. So far the country has protected 15 percent of its ocean territory and has pledged to increase that to 30 percent by 2020. Michelle Murray, chief executive of the Seychelles-based Island Conservation Society, called the expedition a once-in-a-lifetime opportunity. "We're the first to feel the true impact of sea level rise," she said. "Climate change poses the biggest threat to our survival, to our existence as a nation."